Moylan's is another of the breweries that finally made a highly anticipated debut in the Houston area last year. The Novato, CA brewery was founded in 1995 by Brendan Moylan, who is also a co-owner of the Marin Brewing Company. 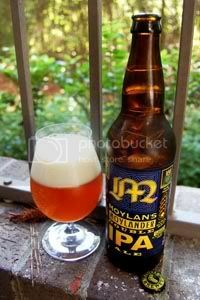 Moylan's is known best for their monstrous Double IPA, Hopsickle, but today we're starting with their "small" Double IPA, Moylander. Fat and resiny, with aggressive and excessive hops swinging on on an enormous malt backbone like naughty monkeys on a vine. Appearance: A slightly hazy, golden-orange body capped by about two fingers off creamy, off-white head. The head sticks around for a while and leaves good lacing. Aroma: From the second the cap is popped, there's a blast of tropical-fruity, citrusy, and mildly piney hops wafting through the air. Underneath the hops, there's some spicy alcohol and a solid caramel malt backbone keeping things grounded. Taste: Up front, it's all about the solidly bitter, citrusy and resiny hops—there's never any doubt that this is a Double IPA. After the hop assault starts to recede, the rich caramel malt backbone comes into focus. Alcohol is detectable throughout, though it's mild and always complimentary. The aftertaste is nicely bitter and endures well. Mouthfeel: A slightly creamy medium body with good carbonation and just a little burn from the alcohol. The hop assault ensures a dry finish. Drinkability: Not quite a sipper, but you're still going to have to take your time a little. Verdict: Moylander is a solidly bitter, yet well-balanced Double IPA that doesn't disappoint—it's not quite at the top level, but it's close. After this, I can't wait to crack open the Hopsickle I have chilling in the fridge.